Great card, Shelly! Love that zig zag background and the image! Great colors too! Blessings to you! I really like your card...it's great! wonderful card! perfect masculine card! Great tech. Love your card! Seriously, how many challenges do you do in a week? I'm astounded by how much you produce. Hey shelly! Thanks for ur comment on my blog. The jeans and hair I did with C2, C5, C7 and then I also added the special black 110 to get it a little darker in areas- blending with the C2,C5. Shelly- great guy card! 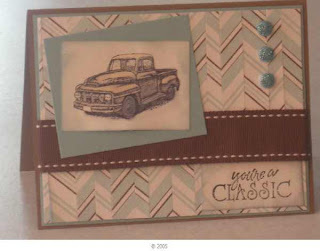 I love the colors and that truck image is one of my faves! This is so wonderful! I just love that background! WOW! The background is so much fun, love it. The colors are great, too. Really nice manly card. This is great. I'm always looking for masculine ideas...great job! !